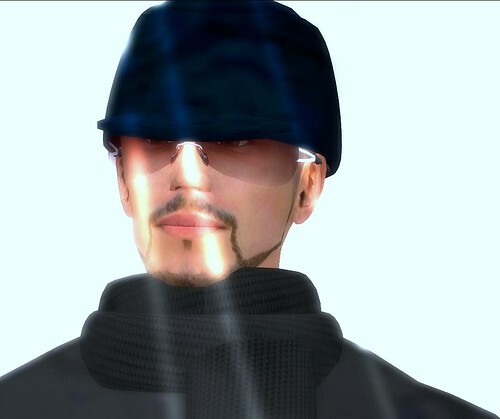 Not three months ago, the Czar of Second Life blogging, Hamlet Au, and his New World Notes introduced the world to a fellow by the name of Dizzy Banjo - together with his partners Eshi Otawara and Chase Marellan - when they launched Parsec, the application that enables you to move objects with your voice. This happened within days of Dizzy's putting the finishing touches on the music and sound for the artful and complex DynaFleur installation... (teleport directly from here). Even after all that, as well as the titanic follow-up that ensued after the introduction of Parsec, Dizzy just keeps knocking out new and lofty projects. When you visit the freshly debuted in-world Mexican "Ruta Maya" regions (teleport directly from here) and turn on your stream, you hear music. Nothing unusual about that. But what you may not realize is that this rich and enveloping music was composed for no other purpose and for no other place, and that those native sounds you are hearing are hardly incidental. All were specifically created and positioned here and there intentionally to boost the narrative of your experience by that same soundscape artist, Dizzy Banjo (rez: 1/30/2005). Composing music for an immersive 3D environment is not unlike scoring a feature film. In both instances, you strive to elicit an emotional response that varies and grows with each encounter. 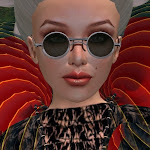 Perhaps the greatest difference between the two is that rather than create music as a backdrop for one scene or another, the composer in Second Life works within small areas of a region to orchestrate the experience for those micro-zones. Very few people realize what an undertaking this is! For this reason, I thought it was time to get with Dizzy and learn more. What are the steps you take to create a custom soundtrack, and what do you need to know from the client? Dizzy Banjo: For me, defining what the project directors want to achieve - emotionally - is the key factor, even surpassing the actual ‘subject’ itself. From an early stage with Ruta Maya, it was clear that we wanted to achieve a score which immersed you in the emotions of the landscape, as well as containing cultural references. To do this, we expanded the instrumentation beyond purely authentic Mayan instruments (although the score does contain many) to a full orchestra, with a large contingent of tuned percussion. With this palette, I was able to tap into a much richer, cinematic sound. I often ask many questions which the client hasn’t thought about yet, and can’t answer. But generally I find the only thing I need to do is establish a trusting open discussion – and then I can get all the information I need. Technically, I write in a mixture of various applications, depending on the needs of the project. These days I generally compose and program directly into Nuendo. If the project budget/timescale allows for live musicians, I export out MIDI parts into Sibelius, but often the projects stay in Nuendo right up until mastering stage, which I do in Wavelab. I use a huge range of virtual instrument and effects. Ruta Maya required a lot of South American percussion and wind instrumentation. My current core orchestral template runs across 4 PC slave machines linked with FX Teleport and consists of a mix from the Vienna Symphonic Library, the East West Quantum Leap Symphonic Orchestra, Project SAM, and bits of older libraries like Miroslav Philharmonik. However I play violin, viola, piano, guitar, bass and banjo (hehe) myself, so I try to use as many live instruments as possible. How much did you have to "alter as you go," between the initial plan and the final outcome? Dizzy Banjo: Luckily, prior to working on Ruta Maya, I scored the music for the Machinima for the first Visit Mexico – Chichen Itza sim. A lot of the musical direction and general approach to Visit Mexico inSL was developed at that stage. Ruta Maya was a development of that sound, so the process of developing the soundtrack actually went really smoothly. Also Valiant Strangelove and Lester Nefarious from Advanced Virtual really placed all their trust in me with it, which I’m very grateful for. I tend to work through the night a lot. I wanted to wait until the build was almost complete before commencing the main body of work. However I did have a number of concepts in mind prior to that. 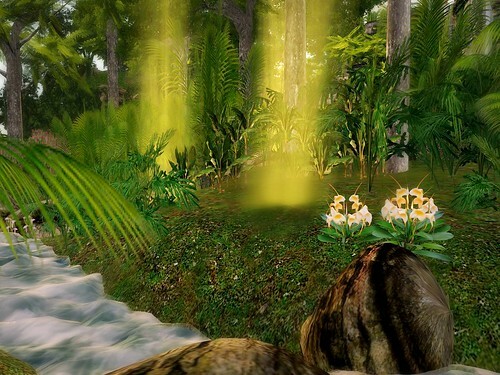 Throughout the compositional process I was often logged in to Second Life with environmental sound playing so I could soak up both the visuals and sounds as I wrote. What does "environmental sound design" mean, and how does this apply to Ruta Maya? Dizzy Banjo: On this project, I think environmental sound design meant exploring a way of vastly increasing immersion through Gestalt effect principles. This involved creating a highly detailed soundscape of many of the sounds of the actual environment of the Real Life Ruta Maya (these were created various sources – some recorded, some from sound design libraries and some from my environmental sound design consultant on the project, Hastur Pieterson). In this way, when you are on the beach and hear the seagulls on the cliffs – you believe there really are seagulls nesting there, even though none are present as prims. In many ways Ruta Maya is a kind of "beyond reality," or "concentrated reality." It’s audibly very dense - the rainforest alone consists of over 40 sound sources - and so rich that you can close your eyes and still feel you are there. I’ve even navigated around the sims with my eyes closed. 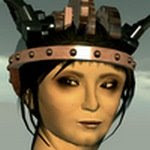 What are some of the biggest challenges that Second Life presents for this type of undertaking? Dizzy Banjo: The 10-sound upload limit is a challenge, but this has been overcome by some clever scripters. One other constraint here is that the client can only play up to 40(ish) sounds simultaneously. This can actually be nice as it reveals more sounds as you move around the islands. Scoring for the metaverse is very different to scoring for a video game or film (which are generally single person/linear experiences). The challenge is to try to find ways of tailoring the soundtrack to individual and group experiences, which are non linear in nature. Eventually I hope to develop ways of achieving this in Second Life, but Ruta Maya makes some initial steps by splitting up the soundtrack into zones corresponding to particular environments. I’m developing various other techniques for controlling the delivery of sound at the moment, which I hope will bring a finer granularity to that experience in future projects. Mayan instruments - all of the Pre-Columbian era - included drums and maracas made of wood, clay and sometimes the tortoise shell. Ceremonial flutes and ocarinas made of fired ceramic, bone, wood, or reeds have also been found at archeological sites. Dizzy performed all of these instruments for the Ruta Maya score. Ruta Maya (meaning Mayan Route) in Second Life features a few (not all, by any means) of the highlights from five of Mexico's southern states: Quintana Roo (there's more to it than Cancun! ), Chiapas (I love some areas of this state better than I do Paris or Venice, to give you an idea of how_much, but do try to set your base camp at San Cristobal de las Casas), Campeche and Tabasco, as well as Yucatan, where Chichen Itza is located.